Chile is doing well compared to most countries, so well that it is no longer a pit stop for business travelers. Families are now packing their bags as well, and staying. Coming from the United States, a country deemed a land of immigrants this is nothing new to me, however… it is here. In an effort to help ease the local population into this demographic shift the decision was made to create a documentary series for the children of Chile by the immigrant children of Chile aka Niños Inmigrantes. Their efforts are funded by an award from CNTV (Consejo Nacional de Televisión) of Chile. Programa que recopila, escucha y presenta las voces de niñas y niños hijos de inmigrantes que viven en Chile. Con el objetivo de buscar la mayor diversidad cultural, sin importar la raza, la etnia, la nacionalidad o el credo, esta iniciativa pretende establecer un canal de diálogo entre estos niños extranjeros y la sociedad chilena con la que conviven. Nos interesa conocer sus historias de vida, sus tradiciones, sus culturas, sus alegrías, sus temores, sus proyectos, en fin… conocer un poco más de la vida de estos pequeños migrantes. Asimismo, este programa busca hacer de Chile un país más amable, tolerante e intercultural. It began by responding to an ad in the paper . We were sent a questionnaire with such items as “What is your favorite Chilean food?” followed by “Do you understand Chilenos?’ and “Do they understand you?” They liked his responses and called him in for an interview. I prepped him for it since he has Aspergers Light which means I coach him through the details of communication, not the heart of it. Life as an expat, where one has to sort out different cultural norms goes hand-in-hand with life as an Aspie. If nothing else expat parents will finally understand what their kids experience when trying to make sense of communicating in a new social context. Well, it turns out they liked what my son had to offer. That same evening they called and said they would come over in a day or so to my home and film. Wait, my home? Why not film all over the lovely town we live in? Oh dear, what have I gotten myself into? Why sure, c’mon over! Let the cleaning marathon begin! Upon arrival they went straight up to his room. His room is an opus to transportation: License plates, posters of cars, sketches, model cars…and he made sure to give them a full tour and historical background of anything with a motor that caught their fancy. The producers kept commenting to me that they had never met someone so young with such a vast knowledge of vehicles. He was at ease with the film crew, narrating away for the camera. They said his personality was unlike that of the other children they worked with. Many whom shut down at the sight of the camera or when surrounded by so many adults. Every now and then a member of the crew would ask me about different aspects of our home such as the list of chores I had posted for the kids, a jar of peanut butter, myself wearing an apron and the mural of my children’s school work taped to the kitchen wall. 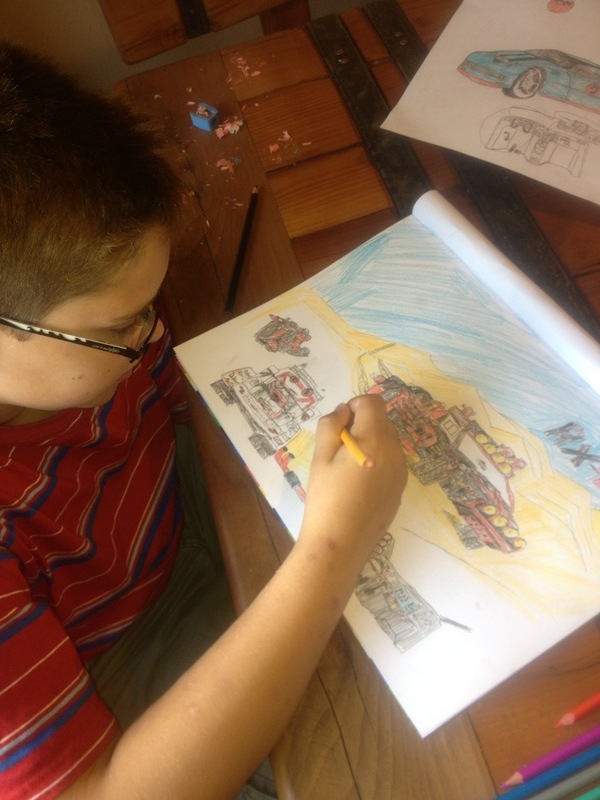 As part of the project they provided him with art supplies and requested he draw some vehicles for the episode. Several months have transpired since production of Niños Inmigrantes began. Yesterday’s component involved a 12 hour shoot in my home. The neighborhood kids, gardeners, nannies and even the community guard were excited about the hubbub. I saw it as an opportunity to reach out to my Chilean neighbors, whom are very private. I had no trouble bringing the kids in to have a look, but their parents were another story. I did actually have to take two lovely mommies by the arm and “drag” them in. I convinced them that they were not imposing by saying that everybody else in the world seemed to be in my home, why not them? The filming concluded with a camping scene in our backyard. I watched as Chilenos tried and failed for the longest time to start a fire. I, being the tactless expat that I am, poked fun at them. They are after all master “Parilleros”. Grilling is to Chileans as baking is to Martha Stewart. Eventually, after handing them a ball of newspaper to light underneath their visually appealing firewood the flames grew and the director called “Action!” Now I have a large circular patch of scorched earth in my yard with which to commemorate this occasion. The producers told me that they originally envisioned a series focusing on children from neighboring Latin American countries and yet were pleasantly surprised to find that people from all over the world were moving to Chile “Even Greece!” they kept telling me. I look forward to meeting the other families participating in this project and learning from their experiences as well. That of course is another episode, stay tuned.